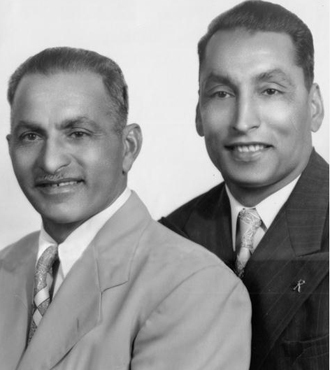 Donation given in honor of two brothers who were early Punjabi immigrants, Katar Singh Khera and Bawa Singh. In 1948, Khera left India for the United States. Bawa Singh had already been working as a foreman on Richard Wilbur's fruit ranch in Yuba City, CA. Singh found Khera a job and helped him adjust to life in America. Singh had been living in the United States for decades. He entered through Mexico in 1924, worked his way north, and eventually settled down in Yuba City, marrying a Caucasian woman. 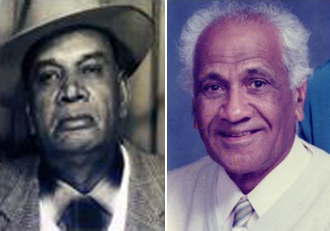 Singh worked for Richard Wilbur until his death in 1968. In 1952 after gaining experience at Wilbur Ranch, Khera decided to purchase 20 acres of farmland for himself. By the 1970s, he had acquired close to a thousand acres, which he later divided between his sons and nephews. An active community member in Yuba City, Khera was involved in major fundraising efforts for local gurdwaras and Fremont Medical Center. He always loved returning to visit his village in India. Katar Singh Khera passed away in 1994 in India. Born in 1889 in Phadana, District Lahore, Sardar Karm Singh Sandhu came to the United States nearly twenty years later in 1908. After arriving, Sandhu married Santi Sandhu; together they had three children—two girls and one boy. Sandhu successfully farmed over 1000 acres of cotton in the Imperial Valley, where he was an active member of the community. He was part of the establishment of the El Centro Gurdwara, giving money to support the temple. Sandhu was also a big supporter of the Gadhar Party movement. In addition to his accomplishments in the United States, Sardar Karm Singh Sandhu was also responsible for financially securing a large section of land for his remaining family members in India after Partition. He also helped support his nephews Amar Singh Sandhu and Harbhajan Singh Sandhu to come to the United States in the 1950s and 1960s. 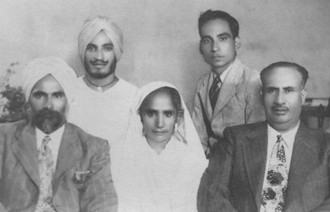 Pictured by name from left to right: S. Harnam Singh Sandhu, Gurbaksh Singh Sandhu, Inder Kaur Aulakh, Balbir Singh Sandhu, and S. Karm Singh Sandhu. 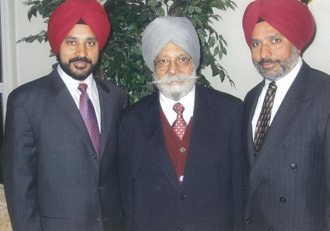 As a young man, Kartar Singh Kajla left Punjab and came to the United States. He arrived in 1924. As most Punjabis did in Yuba City, CA, Kajla was employed on local farms and worked hard to save money. By the late-1940s, he had saved enough to buy his own property where he raised fruit trees. Kajla returned to India only once in 1950, at which time he married Verinder Kaur (1951), the sister of Baldev Singh. Together they raised four children. Remembered as a good-natured man and always helpful, he was instrumental in his nephew’s life. 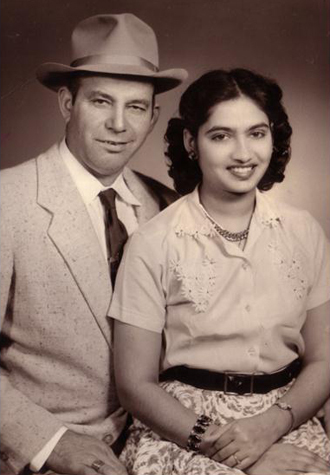 Kajla filed an affidavit of support to bring Singh to the United States as a student in 1954 and helped him to adjust to life in the United States. Kajla was proud of his Indian heritage and helped to organize the annual India Republic Day celebration in Yuba City on January 26th. He passed away in 1970 after living over forty years in California. May his life, and that of all the Punjabi pioneers, be memorialized for future generations to appreciate. Sukhbir Rai was born on February 2, 1934 in Sargodha, Pakistan . At the age of thirteen he was force to relocate to the India side of Punjab because of the turmoil cause during the Partition. Less than ten years later, in 1954, Rai picked up and moved again, this time to seek a better and more prosperous life in the United States. He came by plane to San Francisco where he was greeted by an uncle who put him to work and found him a place to stay. Once in Yuba City , Rai found employment in local orchards, working ten to twelve hour days to save money so that he could one day also buy his own farm. 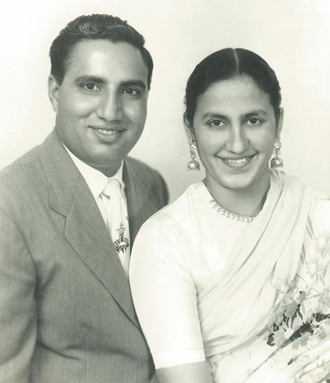 In 1958, Rai returned to India to marry to Gurmit Kaur Biring; they would eventually raise three children together in California. Their eldest daughter is now a local schoolteacher, one son is a full time farmer and another is a network engineer and part time farmer. When Rai returned to America from India he saved enough money to buy his own farm. He ran his own operations for decades and also spent time contracting with other farmers. Rai is now retired and has passed on his farming business to his children. They currently farm over 350 acres of land as well as run a commercial harvesting business. Sukhbir Rai still lives in Yuba City with his family and has 4 grandsons and one granddaughter. Donation dedicated to my parents, brother, and wife. My father has been instrumental in shaping my career and is a major source of motivation – actually serving as my English teacher in high school. Throughout his life, he has stressed the need for hard work and discipline in my own life. My younger brother, Dr. Sukhwinder Pal Singh from Clovis, CA, has always stood by me. I would not be what I am today without the support of my wife and children. I am sure the exhibit at the Sutter County Museum will provide insights into the history of Punjabi’s in America for generations to come. Guru Nanak Dev Engineering College, located in Ludhiana, Punjab, was established by the Nankana Sahib Education Trust with a clear mission – removal of economic backwardness through technology. Established in 1956, the college was built on an eighty-eight acre piece of land donated by the Gill village. The college continues to produce a technically competent and intellectually vital workforce for the new world. Many graduates reside in Northern California and stay in touch with each other through their alumni network named GENCO – founded in 1974 by five ex-students. GENCO continues to thrive today and holds five to eight charitable, social, and cultural events for its members and community each year. The "American Dream" is an idea which suggests that all people can succeed through hard work, and that all people have the potential to live happy, successful lives. This concept attributes to most people’s desire to immigrate to the United States. Such is the story of the Deol family. 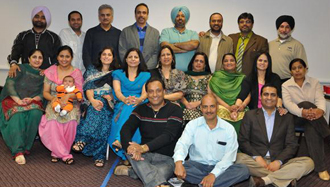 Hitpal Deol was able to immigrate to the United States in 1974 when he married Davinder Takhar who was a naturalized American citizen. Upon becoming a naturalized citizen himself, he sponsored his parents (Darshan Singh and Dawinder Kaur Deol) and three siblings that were living in India (Pritpal, Kiranjit, and Jagdeep) who joined him in December 1978. In 1990, he sponsored his fourth sibling, Kanwaljit, who had been living in Canada since her marriage. Through his dedication and hard work, initially doing farm labor to becoming a successful entrepreneur, Hitpal is living the "American Dream", as are his parents and siblings. They came to America seeking not fame or fortune but something even more precious- India’s freedom from British rule. Many came but a few ever went back having paid the ultimate price with their lives. Never have we seen a group with higher ideals and personal code of conduct than the Ghadarites. They lived by their word and died by their word. Let not the youth of today forget the history and sacrifices made by these individuals not for themselves but for future generations. Our father continued in the footsteps of his uncle by searching for a way to serve the small Punjabi community of Yuba City in 1949. As the community started to grow, there became an awareness that the Stockton Sikh Temple was too far to travel. We needed a Sikh Temple in Yuba City. Our father along with a few of his other close friends and families took on the challenge which culminated in the establishment of the Sikh Temple Gurdwara Yuba City in 1969. He was very dedicated to serving the needs of the community. he used to say, "nothing will go with you except your good deeds." 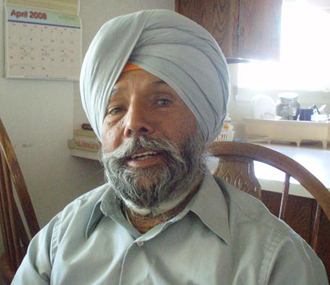 Harbhajan Singh Takher grew up in India and immigrated to the United States on February 18, 1950. Upon arrival, he worked for his uncle, Swarn Singh Takher, who was foreman at Border Island near Lodi, California. He lived in a labor camp and learned to communicate in English and Spanish during his time there. Having experience working his family farm consisting of corn and wheat in India, he engaged in farm labor in the crops of corn, celery, tomatoes and asparagus with ease. The only initial hardships he experienced was adapting to the more modern methods of farming compared to those in India. He continued to work at Border Island for three years upon which time, he shifted to Yuba City to work his uncle, Swarn Singh Takher’s land. His wife, Harbhajan Kaur and son, Mukhtiar joined him in May, 1955. He continued to farm his uncle’s land for the next 17 years. He then purchased 40 acres (peaches and prunes) from his uncle and became a farmer. He feels immigrating to United States afforded him more opportunities and helped him advance as a farmer. 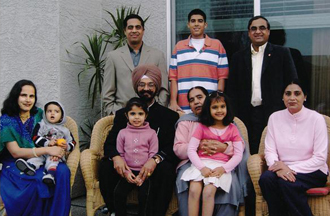 He continues to reside in Yuba City with his wife, sons (Mukhtiar, Harinder, and Harminder) and seven grandchildren.